A high-performance exhaust system helps your car perform correctly in more ways than you may realize, regardless of whether it has a stock or aftermarket exhaust system. Your car's performance exhaust system keeps the engine running correctly and toxic exhaust fumes from entering the interior. High-performance exhaust systems provide your vehicle with the best possible fuel efficiency while also reducing harmful exhaust emissions that pollute the air. Other functions of performance exhaust systems for cars include reducing the temperatures of the exhaust and muting engine noises. 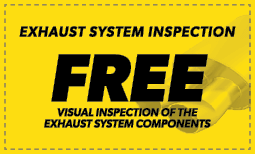 Make sure to stop by Meineke #2262 in Baton Rouge, LA, right away if you suspect your exhaust system has a problem. It's important for drivers to know the signs of a failing aftermarket exhaust system. The easiest way to tell if there's a problem is when your exhaust system starts producing a louder sound. This means there is a leak in your high performance exhaust system. Leaks are usually caused when the flexible weave of the exhaust system starts to rust. This is the most vulnerable part of your exhaust. If you've noticed that your exhaust is louder and you're worried about a leak, contact Meineke #2262 at Baton Rouge, LA. and we'll diagnose the problem and take care of any muffler repairs you need. A high-performance exhaust system for your car plays an essential role in the proper operation of the vehicle. When your car engine runs, fuel combustion naturally creates harmful gases. The performance exhaust system expels those gases from the car and keeps them from entering the interior. It also controls the emissions and amount of pollution released into the air while quieting engine sounds. It is important to fix a leak in high-performance exhaust systems as soon as it is detected because leaks can affect your car's performance. 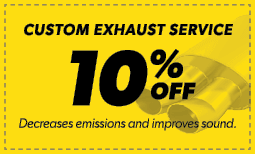 Visit your local in Baton Rouge, LA, to have your exhaust system checked out. A high performance exhaust system is vital to keeping your car running smoothly. Problems with your performance exhaust can cause loss of fuel efficiency and also lead to danger from toxic engine fumes. To keep your exhaust and car muffler functioning well, be sure to have your car checked by an experienced performance exhaust systems professional if you notice warning signs such as loud engine noises, steering wheel vibrations or lessened fuel efficiency. Ignoring these warning signs can cause increasingly serious car problems down the road. Contact Meineke #2262 in Baton Rouge, LA as soon as you notice any of these red flags for car exhaust trouble. When choosing a muffler shop you need to consider several things including location, your repair costs and the availability of custom exhaust systems. To keep your vehicle in great condition, it’s important for you to select a repair shop that has a reputation for high performance exhaust repairs and replacement. In Baton Rouge, LA, the best way to keep your repair costs down is to bring your vehicle to Meineke #2262. Our experienced and certified technicians and our huge selection of performance exhaust systems for cars are the most affordable and practical solutions to all of your car repair needs. Make sure to visit us soon to get your vehicle ready for the road.